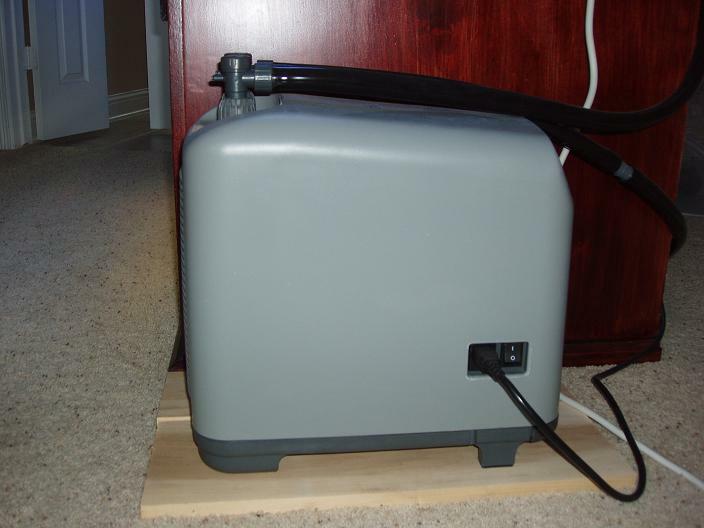 The TR-20 installed backwards on my 155-gallon system. 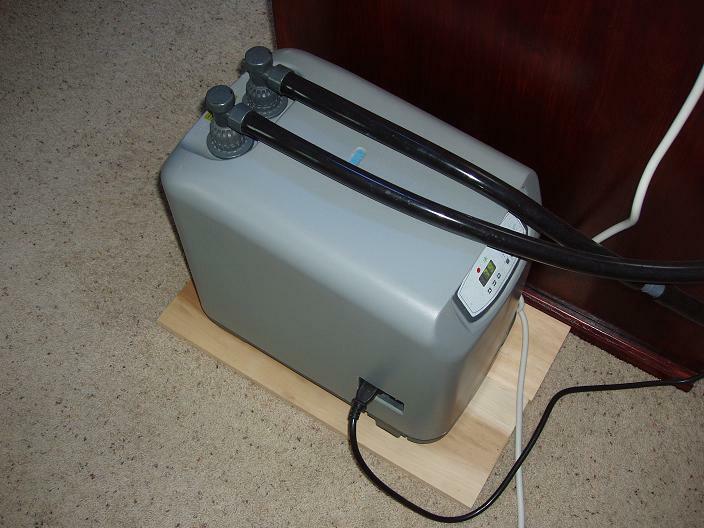 I purchased my Teco Seachill TR-20 1/3 HP Chiller a while back in August 2009 and I have been using it for just under a year now on my 155-gallon system. I haven't found many substantive reviews of this chiller online (except for one by Advanced Aquarist magazine), so I thought I would offer my thoughts on it. I purchased this chiller last summer when I noticed my temperatures creeping up to 84F. Although I initially had some problems with it - which I will describe below - the chiller now does an excellent job of cooling my 155-gallon glass system about 6F during the summer months. I have the temperature set to 77F with an offset of 3F, which basically means that the chiller comes on as soon as the temperature touches 80F and stays on until the temperature just touches 77F. Except for a few seconds at 77F and 80F, the system temperature basically stays between 78F and 79F. When I first setup the chiller I had a lot of trouble with it cycling on for just 60 to 80 seconds before turning off, only to turn back on again within 15 minutes. Needless to say, this was not the desired operation. After a lot of troubleshooting I made two important changes. 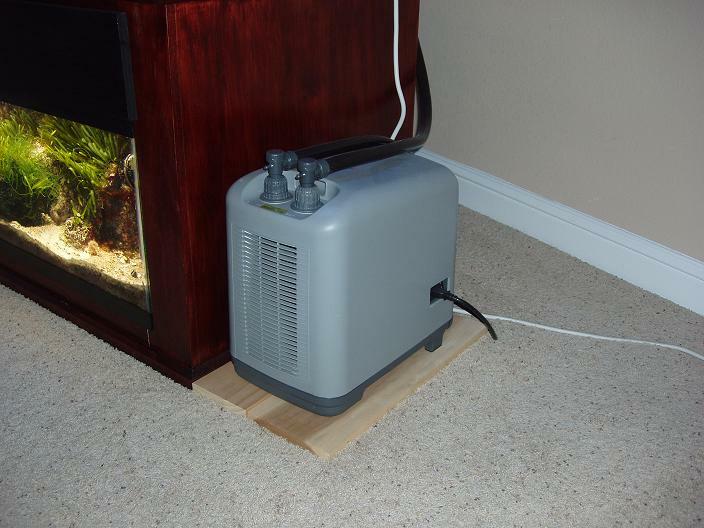 First, I added a wooden board underneath the chiller to lift it off the carpet. The TR-20 is supported by four corner legs that tend to sink into carpet, leaving very little unobstructed clearance below the chiller. Since the TR-20 draws in air from below it - rather than from the side, like most chillers - this results in severely reduced air-flow. Note the clearance between the bottom of the chiller and the wooden board. The second change I made, after quite a bit of troubleshooting - including taking the unit all the way to the TecoUS headquarters in Dallas, was to increase the power of the pump supplying the chiller. I upgraded from a Maxijet-1800 (475 GPH) to a Maxijet-3000 (775 GPH). This made quite a remarkable difference. After doing this, the chiller started kicking on for around half an hour every 2-4 hours depending on the day. Although 475 GPH of flow is smack in the middle of Teco's recommended range for this chiller (200 - 800 GPH), I hadn't taken into account how much four feet of vertical head would reduce the pump's performance. Since I had my chiller taking in water from the sump and returning it back to the display, 475 GPH was reduced to around 200 GPH. Even the new Maxijet-3000 is reduced from 775 GPH to roughly 400 GPH with this back pressure. It was relatively easy to un-plumb the chiller when I had to take it to Dallas because the plumbing is well designed. Although the vinyl tubes can't be quick-disconnected from the valves, the valves themselves can be quick-disconnected from the chiller body. However, be careful not to misplace them as a replacement set will cost you about $25. The quick disconnect valves function like a pvc gate-valve and union in one. 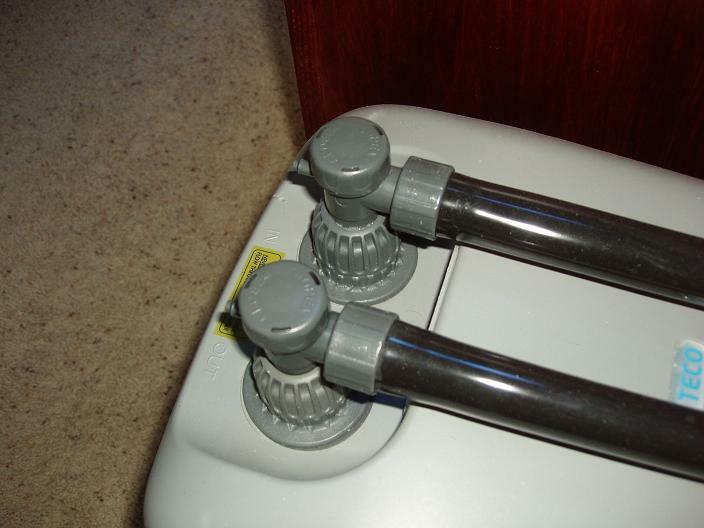 The air-filter is easy enough to remove and rinse under the sink. I would recommend ordering two air-filters with the unit so that you can swap in an alternate while the first is still drying. Your other option is to use a tissue or vacuum cleaner to clean it so that it doesn't require any drying in the first place. In any case, my air filter has never really had any visible build-up on it. The chiller is the noisiest part of my setup when it kicks in. However, it still makes quite a bit less noise than I expected. There is an optional Quiet Mode that reduces noise at the cost of performance, but the noise level is barely reduced. I can't think of a situation where the small decrease in noise afforded by Quiet Mode would be meaningful. The real issue, however, is the heat that is blown out of the exhaust. I have the unit installed backwards so that it blows this air into the room rather than behind the aquarium stand, where I fear it could heat the aquarium further. The control panel is minimal, but functional. It displays the current temperature of the water by default. A green LED indicates that the chiller is running, and the red LED indicates that the heater is running. Toggle buttons for Quiet Mode and an optional UV sterilizer are also present. The control panel on the TR-20 is simple but functional. I purchased my unit during one of Teco's well-known 20% off sales, so I sprung for the optional integrated 400-watt heater as well. This allowed me to remove my other heater from the sump and reduce clutter. A 400-watt heater is a little more than I really needed but it is the only wattage of heater that Teco sells with their chillers. I still find it amusing that even Teco's micro-chillers for nano aquariums come with 400-watt heaters. I didn't spring for the optional integrated UV sterilizer kit. One of the main reasons I was drawn to the Teco Seachill line was, and still is, their efficiency. The unit draws only 480 watts at 3.9 amps and delivers (according to Teco) 2,600 BTU/h. It's still not clear to me how anything can draw 480 watts of electricity and use that to remove roughly 750 watts of heat, but I'm not an engineer. The unit does sacrifice power for efficiency though. Most other 1/3 HP chillers claim to remove over 4,000 BTU/h of heat. However, given that the rest of my setup already draws 650 watts, the last thing I felt that the electrical circuits in the room needed was a new 1,000 watt device kicking on. In any case, although it took quite a bit of troubleshooting, I am very pleased with my TR-20 chiller. I would recommend the unit as a solid choice for anyone looking for a chiller, especially when Teco runs another one of their 20% off sales.